This is the form you fill out while waiting on line – Order Form. My math skills are not good enough to tell you how many different donut combinations can be made, but I resisted the urge to get one of everything and kept my selections down to six. Before I get into the donuts themselves, let’s go through the making of the donut! In the video, you can see the worker pour the dough into the donut-maker, which drops dough circles into the hot oil. After cooking for a few moments, they are flipped, and then they travel via conveyor belt onto a rotating plate. An employee then moves them to a rack to finish cooling, and from there, they’re dipped and topped according to what’s on the order form. I realized far too late that I didn’t take any photos of the donuts individually, so a repeat of this one will have to do. (And yes, I couldn’t resist buying the Duck Donuts duck.) I’ll start with the top left donut, working my way around clockwise. It’s important to note that the cake donut is the only style available at Duck Donuts. They don’t do yeast donuts, but you won’t care. I got the simple cinnamon sugar donut to serve as the control factor in this tasting. I figured it made sense to taste the donut itself without anything added to it. Well, hardly anything. And this is why you won’t care that you can’t get a yeast donut – these are the lightest, fluffiest cake donuts you will ever have. I think that the Krispy Kreme challenge should actually be the Duck Donuts challenge. I didn’t love this one as much as I thought I would. I thought it needed more chocolate. If it had been a chocolate cake donut with a chocolate glaze and the peanuts on top, it probably would have been perfect. I got this one as the yin to the chocolate peanut yang, but it didn’t work out quite as I’d hoped. Just as I thought that the chocolate one could have used more chocolate, I thought the peanut butter glaze could have been more peanutty. That’s a word now, just go with it. I think it would have been a better decision to do the chocolate glaze with chocolate sprinkles and the peanut butter glaze with peanuts. Oh well, next time! I got this one because it was the flavor of the day. Otherwise, I’m not sure I would have gone for an orange glazed donut. But I turned out to be wrong again! This donut was ON POINT. It tasted exactly how I was hoping it would taste. The combination of the vanilla glaze drizzled over the orange glaze melted in my mouth almost like a real creamsicle would have. Nothing to really complain or comment about here. This classic combination on top of the amazing Duck Donut was just perfection. It would have been great with just the glaze, but everything is better with rainbow sprinkles. I’m pretty sure it’s impossible to have maple bacon as a flavor option and not get one. Unfortunately, this one was probably my least favorite. The maple glaze was perfect, but I found the bacon overwhelming. I know this is not generally a popular opinion, but I think this donut would have been better with only a small handful of bacon bits, rather than the copious amount that was dumped on top. Another small bacon critique is that the pieces were chewy. This is perfect if you’re eating a strip of bacon with your eggs, but I think that crispy bacon pieces would have been better suited to the donut. Candied or chocolate-covered bacon pieces would have been even better! 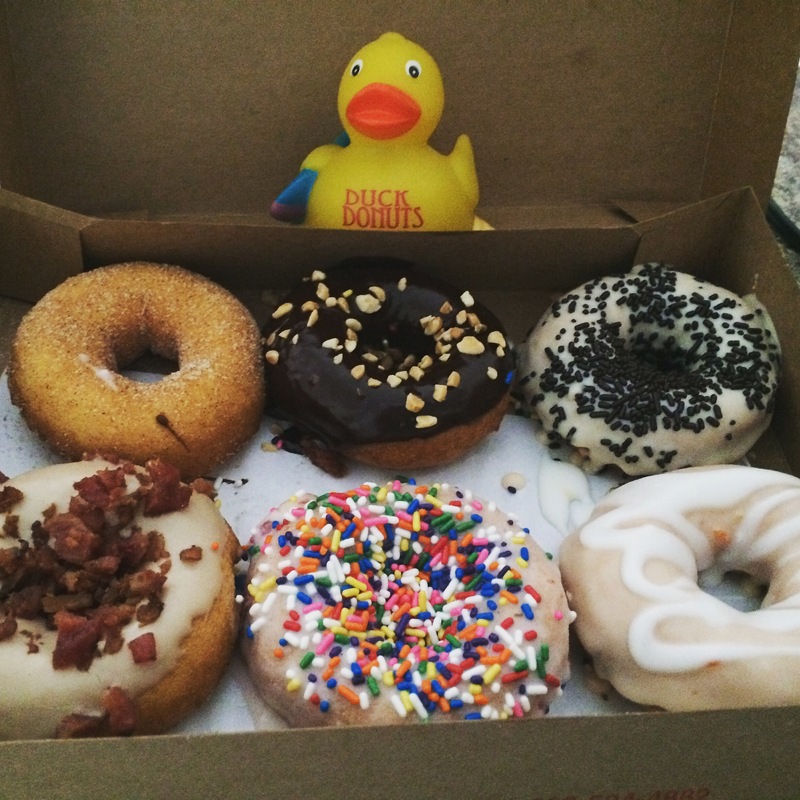 If you’re hungry for donuts after reading that, see if there’s a Duck Donuts near you! If you live near the Cary location, which is where I went, they’re now operating under summer hours! That means you can get your donut fix from 6am to 7pm every day. So what are you waiting for? Go check it out, and tell me what your favorite is!